Stories – in both games and traditional media – are all about similarities and differences. You can certainly tell a story or run a game where no one has any differences, and the status quo is always present – it just wouldn’t be all that engaging. Even documentaries demonstrate the differences between the subject and the viewers – while also attempting to highlight the similarities to make the differences readily apparent (“Meerkats are just like us, but also totally different!”). At the most basic level, conflict stems from at least two actors – here meaning someone or something who is taking action – experiencing a difference of opinions. Two people competing over the same goal, someone believing they are right and the other person is wrong, disagreeing over whether discovered artifacts belong in personal collections or museums, or even desiring to be free when others do not want you to be free – all examples of differences spurring conflict. The same holds true for comedy. Comedy likes to illustrate the differences between things, but use them tonally for humor. In one of the truest lines ever spoken on Saturday Night Live, Norm Macdonald as Burt Reynolds wears an oversized cowboy hat and opinions, “it’s funny because it’s larger than a normal hat.” In this case the humor is multi-layers from the audience perspective. It’s funny because it was purposefully pointed out – which is usually not how comedy is done, it IS larger than a normal hat, and the portrayal of Burt Reynolds is larger than life and different than how he would typically be portrayed. Part of the humor stems from having an existing familiarity with Burt Reynolds – though the rest of the comedy stands on its own. One of the best ways to actively implement this dichotomy of same and different is by using one of the best and most time-honored devices of storytelling – the evil twin. If you aren’t familiar with the concept of the evil twin in stories you must first consider how you will keep reading this article on a computer secret from the rest of your Amish community. That done, let’s spend a moment talking about this particular trope. An evil twin is either an actual twin or different version of a character who happens to be evil. In traditional stories, the evil twin is typically an actual twin who makes an appearance to take away the happiness of – or introduce strife to – a character. The evil twin is generally the opposite of the character in question, though an effort is generally made to display some of the flaws of the character in an attempt to highlight the similarities and differences between the two. Typically, this results in much soul-searching by the character until such time as the character- often assisted by the character’s friends – realizes it is just within its nature to be good and kind, warts and all. This decision to be good generally resolves the conflict until such time as the evil twin reappears to once again plunge the character’s life into chaos. A shared genre – but slightly less common – trope of the evil twin is the split personality. 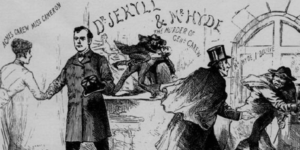 This is your typical Dr. Jekyll and Mr. Hyde situation. One aspect of the character is dominant part of the time, and the rest of the time the other aspect of the character takes over. There might be more than two aspects, and they are likely to be full-fledged personalities – with varying ages, genders, backstories, and motivations. This is often the result of trauma in the character’s past or symptomatic of mental issues. Strictly speaking, this is different than the evil twin, but the story reveals and drama are often similar until the situation is made clear. 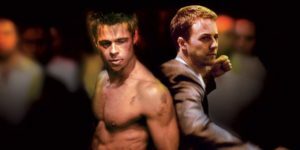 Even then, the different personalities are played as distinct characters with specific goals – Tyler Durden and the Narrator, for example. Just as an evil twin would be, Tyler Durden is the personification of everything that the narrator isn’t – he’s confident, in shape, unfettered in sexual relationships, and wholly consumed with destroying the systems he believes are unjust. Some of these things appeal to the Narrator, and others he recognizes for the out of control impulses they are. I pause here for a moment to lament some of the directions the film took that undercut some of the message of the novel. Still, any Fincher is worth watching. When we venture into sci-fi and fantasy, we get many more options when it comes to the evil twin. We see variations such as alternate reality versions, created versions, and MacGuffin-created splits. This is the arena that gives us the most classic depictions of the evil twin. If you have never seen the Star Trek: The Original Series episode “Mirror, Mirror,” you have felt the repercussions nonetheless. This episode establishes several key components of the evil twin narrative. The episode begins with the crew teleporting back through an ion storm – you know, a MacGuffin – and finding themselves aboard a different Starship Enterprise. The crew we know and love encounter a changed Enterprise who uses violence at the first opportunity to get what they desire. On this brutal ship, we see Mr. Spock with a stylish goatee and mustache punish a crew member with an “agonizer” – meant to cause pain and agony, obviously. It turns out the ship is not the USS Enterprise, but rather the ISS Enterprise – part of an imperium rather than a federation. Crew members advance within the ranks by killing their superiors, and the uniforms are meant to display a certain level of sensuality. 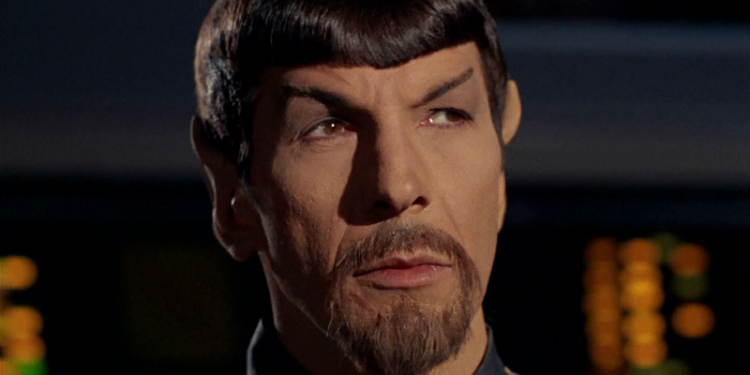 This bearded, cruel Mr. Spock has become iconic within the evil twin genre. Odds are, if you see someone who looks like your friend – only mustachioed, they are probably evil. Ultimately, the evil twin genre works because we are invested in the original characters, and the evil twin is a mechanism to safely play “what if” with them. Good writing can turn this into an arc with lasting consequences, resulting in character growth and excellent conflict. 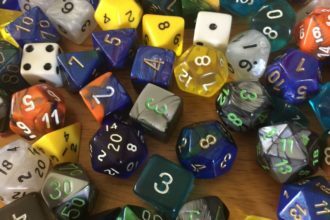 This is a match made in heaven with roleplaying games.The players are already invested in their characters – provided you don’t do something like this early on in the game’s life. There needs to be a baseline and a status quo before it can be shaken up in any meaningful way. When you do reach the point where you want to break out the evil twins, here are a few ways to do it. 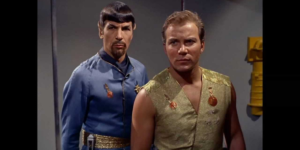 As stated before, Mirror, Mirror is one of the most iconic episodes of Star Trek: The Original Series – and one of the progenitors of the evil twin genre. This is as basic and straightforward as it gets. The party experiences “an event” and travels to an alternate reality where everyone they know is a more evil, selfish version of themselves. This has the advantage of keeping the players as a cohesive unit throughout the adventure, but poses several challenges for the DM. First, the setting needs to be able to allow the NPCs to go crazy with evil. The ISS Enterprise was a discreet location with several known quantities. The rules of the federation were known, the personality of the characters was clearly established, and the party had a moral code that was going to instantly clash with the evil twins. The goal of the episode was two fold: to return to the normal reality, and to make this world a slightly less evil place. This allowed the known story to continue, but to see how the characters confront versions of their loved ones that have had different, sadder life experiences. It’s about the how good of a friend you can be when the chips are really down. In this case – as with most Star Trek: The Original Series episodes – it was about the hope and light in humanity. Will your players become murder hobos, seeking to vent their spleens upon evil versions of the NPCs they know and – ostensibly – love? Or will they find their own inner light and prove their heroics? So you think you’re a clone, now. Every pair of genes is a hand-me-down. 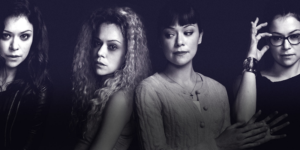 In the case of Orphan Black, all of the clones are sort of the evil clone in their own way – though two are really the evil clone. The two evil clones approach the evil from two banal perspectives – childhood indoctrination and personal gain. One of the clones is basically Enzo from Assassin’s Creed, and the other is a female Dr. Eldon Tyrell. Here, the situation is more complex as the variations versions of an NPC are wholly distinct individuals with the same DNA. The central question around the conceit is Nature vs. Nurture. Are these people truly evil if they contain the exact same genetic data as their counterparts? Are they evil if they are doing what they believe is right and have been carefully cultivated to do their entire lives? Where does the responsibility to their lives end and the blame becomes placed on others? Are they worth saving and deeming? 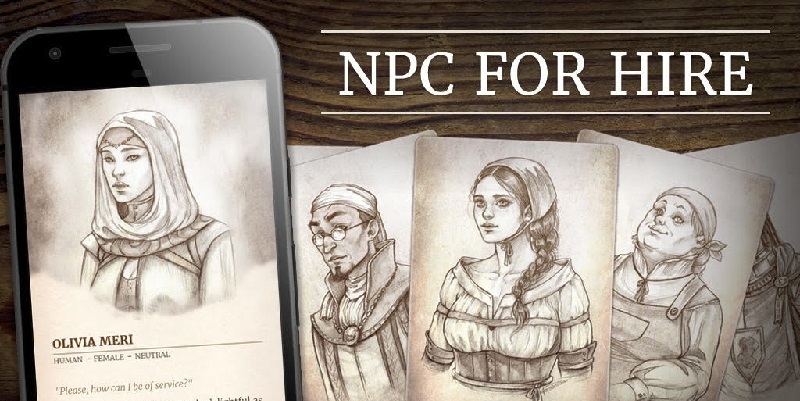 This is complex situation that provides the players an opportunity to cultivate a relationship with someone who both is and isn’t exactly like the NPC they know and love. This varies in the idea that they do not believe they are the same person, nor do they have a throughline of similar experiences. There is only the basic stuff of their being to bind them together. If you are looking for a more thought provoking look at morals, this is a good choice. This was one of my favorite movies of 2013. If you haven’t seen it, you totally should. This one is new enough still – and probably flew below most people’s radars – that I should state that if you care about spoilers, you should stop reading now. I space because I care. Ok, so the conceit is simple: a comet causes a power outage when a group of friends are having a dinner party. When they check up and down their street, they see one house in the distance with their lights on. Upon inspecting the house, they learn that the house is actually their house…just in a different reality. These people have had slightly different experiences with each other, and their grievances with each other – provoked under duress – are different than the other version of them. For most of the film, the narrative focuses on these two groups of friends – only for the film to take a twist and reveal it is not just two groups, but myriad other groups that have been intermingling all night as things unravel. The group is on a time crunch, with realities becoming fixed after the comet passes. However, that isn’t the biggest twist. The biggest twist is the person we have been spending our time with from a narrative perspective is actually revealed to be the evil twin of this whole thing at the end. This one requires a lot of planning on the DM’s part to pull off, and player buy-in – but it would be incredibly rewarding. The DM would need to seed a series of notes and warnings throughout the “locations” that are to be written by different versions of the players – because of course time travel is part of this movie too. Keeping the realities straight would also require a flow chart and tracking. From a player perspective, the DM would want to prepare a series of packages, asking the players individually to open the packages one at a time or pull them aside for a briefing, or a combination. Some of the packages should be empty and some of the conversations should have nothing to do with the story – just a “hey, hang out here for three minutes with me and then we go back.” It also requires a certain amount of player commitment to characters and a table that is ok with player conflict. The last to cover is the most classic – the evil twin is the same as the good twin! The players are approached by a character whom they know and trust. The character tells them of horrible things that are happening around them. They could possibly wake up in strange places not knowing what is occurring, or the character could be imagining themselves as watching from a third person vantage point – such as in Fight Club. The thrust would be uncovering not only what is happening to the character, but eventually confronting this evil twin and needing to resolve the conflict without excessive injury – the character is their friend, after all. Further, there might be a plan put into motion by the evil twin that the good twin has no recollection of at all. The player would then need to scuttle the plan by piecing together how the character would think while it was the evil twin, probably while dragging the good twin around with them. This could be the result of a third-party agent (magic, science, evil forces, etc. ), or through some sort of interpersonal trauma. You could also opt to have this be done by an unsuspecting player – as I suspect many players would like this sort of thing and it would probably work well with myriad stories. The best thing about the evil twin is the player should already care about whatever you choose to do because they have already put in the effort and made the connections. The investment already exists, so the problem isn’t likely to be solved by the judicious application of violence. Most of the stories you would tell with evil twins are going to end up affecting the good twins to some degree, so that sort of trauma is probably going to be frowned upon. I also believe that most groups don’t want to just hack their way through everything. If your group does, then this obviously isn’t for them – but there is absolutely nothing wrong with their gameplay. If any of these end up working for your groups and you end up trying them out, let me know!